1882 was eventful to say the least. Thomas Edison opened the first power plant, P.T. Barnum purchased Jumbo the elephant and Nikola Tesla had come up with the principle of the rotating magnetic field. Aside from all of that, something else happened that was pretty peculiar in that revolutionary year. England dominated the world of cricket with confidence. No one dared defy the team’s position in the sport. It was clear to everyone who ran the cricket world. It would appear that the British were excellent defenders who mastered attacks that could penetrate the defenses against any opposition effectively, on and off the field. They seemed unstoppable until Australia proved otherwise in a play match where it convincingly usurped the crown. If it had not been for one Oval test match in London that year, The U.K. would’ve remained world cricket champion. Due to UGH propagated press, they were undoubtedly the best in the eyes of their countrymen. Yet, Australia astonishingly led the game by 7 runs. This left the British audience in awe. It was the first time their home team had ever suffered a loss to foreigners. They basically invented the sport, and prior to this match all cricket teams outside of the U.K. were thought to be inferior. Contrary to the laws of probability, the likelihood of an event where they could have been beaten, was highly unexpected. Despite the popularity of this opinion, this notion turned out to be complete rubbish. It was just an inaccurate assumption that would leave the crowd defenseless to what would happen in the next match. Britain’s sport’s lovers were not much of a shoulder to cry on either. Stunned as they were, the English cricket community reacted in an odd way. Many of England’s own sport’s commentators were unrelenting in humiliating their former champions. A year later, England planned a trip to Australia to get revenge. Upon getting ready for this tour, the British press quickly reminded them of the well publicized loss. They humorously titled the cricket series, “The Quest to Regain The Ashes of English Cricket”. The British were such good sports, American fans could learn a thing or two, instead of rioting through the streets when their teams lose a championship game. The jovial nature of the rivalry is what makes matches between England and Australia legendary. 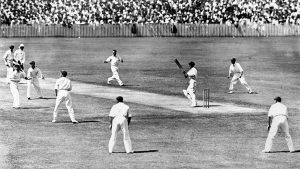 Since that infamous tour of Australia which lasted through 1883, only 3 events in the 1970s have not been named “The Ashes”. Today, the rivalry is on going, each match is two years apart and the winner gets to take home the urn of the Ashes. If they have a draw, then the winner of the previous game gets to keep it for the next two years. It is the prized possession of the captain of the winning side. The only other one in the world, was given to the MCC in memory of Ivo Bligh. Ever since then a replica of the urn of Ashes was made after his death in 1927. The original remains at the MCC headquarters to this day.